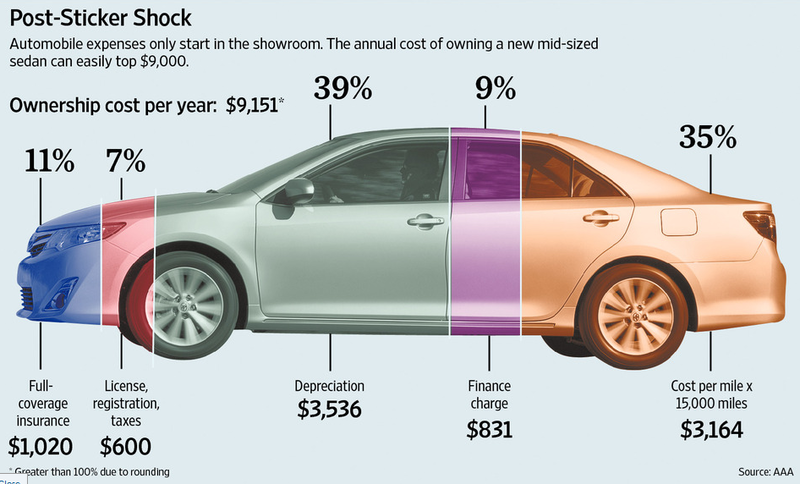 Most of us have noticed that it costs more than ever to own and operate today’s automobiles. Between gas, maintenance, finance charges and more, an annual report by AAA auto club provides an eye-opening look at the monthly costs. For example, if you drive a mid-size Sedan such as a Toyota Camry or Ford Fusion, the monthly costs are an average of $760 per month – $9,150 per year for gas, tires, coverage, license fees, etc. For an SUV, the monthly costs are even hirer, approximately $967 every month – that’s $11,600 annually! And let’s not forget about random expenses such as carwashes, parking fees, and speeding tickets. Add in the square footage costs of your garage – roughly 400 square feet at $100/sq. ft. totals $40,000 of mortgage going to house your car. Whew… Makes us reconsider the costs of daily commuting vs. public transportation. 1. Start this discussion by dividing students into groups. Have each group develop a list of all the costs of buying a new car. 2. Next, have the groups develop a list of all the costs of owning a new car. 3. Record their answers on the white board for all to see. 5. How does the WSJ list compare to students’ estimates? What was surprising, expected? 6. How might these costs affect people’s decisions on where to work and live?